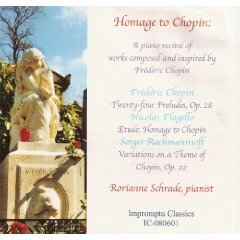 Homage to Chopin is the title of this first release from Impromptu. My initial thought was “what a great program”. The Rachmaninoff Chopin Variations are based on his C-minor Prelude and the subtitle of the youthful Flagello Etude (written when he was 14) is “Homage to Chopin”. To complete the relationships, Schrade’s notes tell us that this was the work Flagello performed when he first met Rachmaninoff. While Chopin’s opus needs no introduction, Rachmaninoff’s Chopin Variations are rather obscure. When I first discovered it, the old Schwann guide listed just one recording and it took some effort to obtain a copy. There has been perhaps a dozen since then, and Schrade’ ranks right up there with Bolet, Rodriguez, Wild, and Shelley at the top of the list. It is one of the few major works of Rachmaninoff that Ashkenazy has never recorded. Only three times in his compositional life did Rachmaninoff use the variation form, and this first one came during a tremendous creative spurt that included 2nd Suite for two pianos, Concerto 2, Cello Sonata, Spring Cantata, Songs, Op. 21, and Preludes, Op. 23. Listeners familiar with the late Corelli Variations and Rhapsody on a Theme of Paganini will find many of the stylistic seeds of Rachmaninoff’s variation technique here in the Chopin-based work. I believe that its size (over 25 minutes) and significant difficulty are the prime reasons we have fewer recordings and performances of this piece than say, the Preludes and Etudes-Tableaux. The Flagello Etude will bring to mind the Chopin Prelude 16 (B-flat minor) and also the Revolutionary Etude. It points to a very talented and technically proficient teenager. Schrade’s performances are marvelous. She has a big virtuoso romantic approach that is exactly what I like in these works. She is also capable of soft, nuanced legato phrases – often called for in these works. She notes that this is a recital that she has performed many times, and it shows in her approach to the Chopin especially. While I don’t consider the Chopin Preludes a unified work, I regularly listen to them that way and have heard at least two concert performances of the complete set. I believe that one needs a different perspective for the complete set than for the pieces on an individual basis, and clearly Schrade agrees. I suspect that much of this recording was made in large continuous groups. In any case, as performed here, they make for a complete listening experience. I will keep my eyes open for further recordings from this label and artist. To order CD, please go to CDBaby.com and type in "Rorianne Schrade" (or just "Rorianne"). It is also available at Amazon, ITunes, and other online stores.